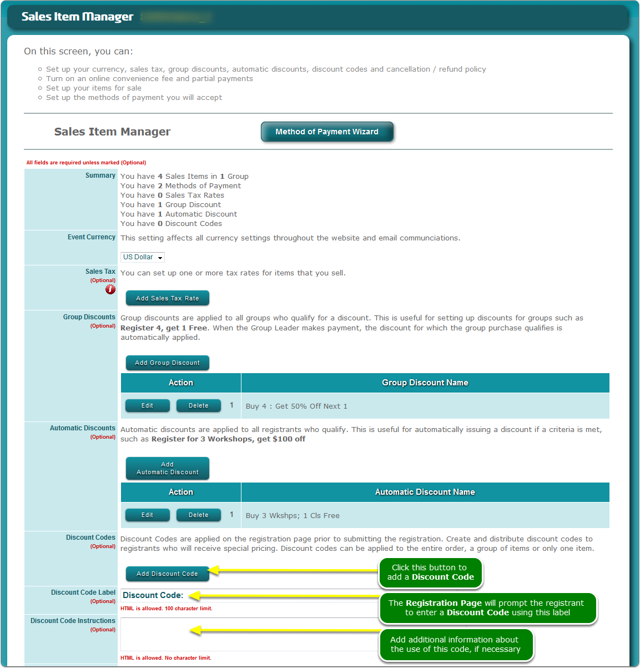 Help Documents - Version 5 Add Sales Items (Tickets)How do I set up Discount Codes? Group Discounts - can ONLY be used when Group Registration is in use. 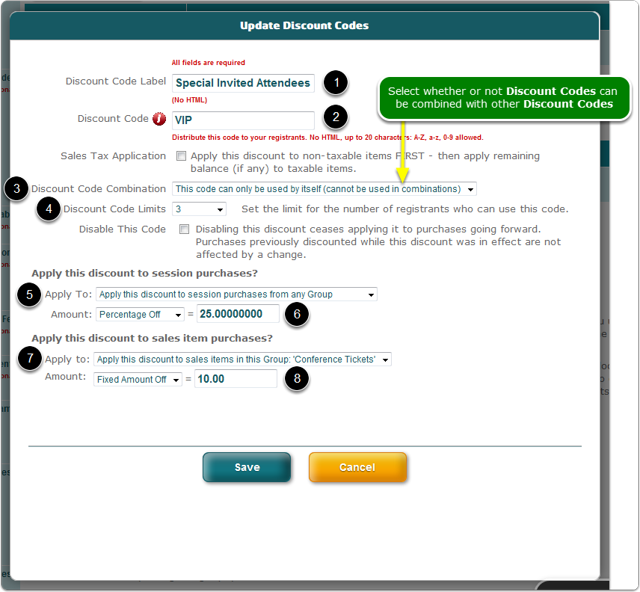 These are designed to allow group discounts, such as buy 5 tickets, get 1 free. Discounts can be contingent on session selections and ticket purchases - How do I set up Group Discounts? Automatic Discounts are automatically applied when any combination of session selections and/or sales items are purchased. They can be restricted to a date range, can be a fixed dollar or a percentage discount and can be constrained to either registrant types and/or method of payment - How do I set up Automatic Discounts? Scroll down to the Discount Codes section. This example discount code, VIP, will receive 25% off any session purchases and $10 off any ticket purchase from the Conference Tickets group, only 3 registrants may use it and it may not be combined with other discount codes. NOTE: the arithmetic for the $-295.00 discount is correct. 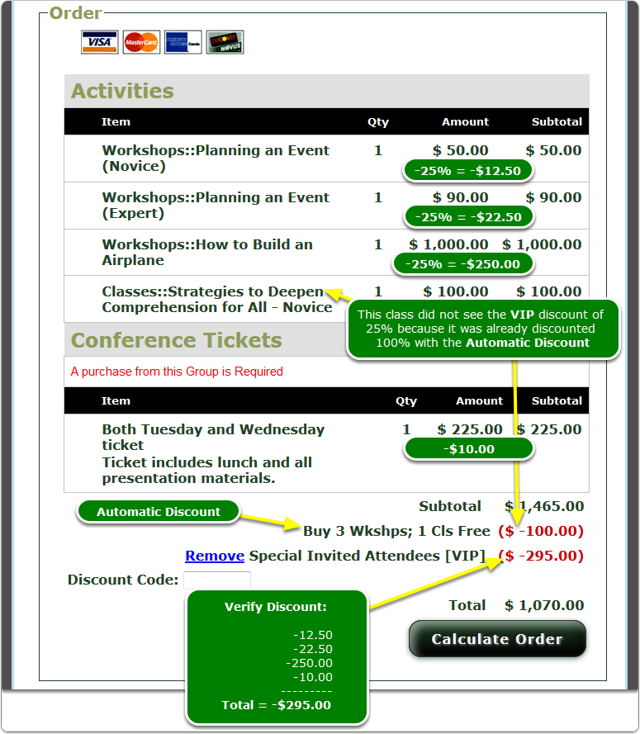 The class was already discounted to $0.00 because 3 workshops were purchased and the 100% Automatic Discount was applied to the Class item. Prev: How do I set up Automatic Discounts? Next: How do I set up Partial Payments?